If you’ve ever been lucky enough to see a “shooting star” in the sky, then you understand why they are the topic of so many songs and children’s rhymes. Catching one with your eye feels like a special occurrence, maybe even a sign of good luck or good things to come. 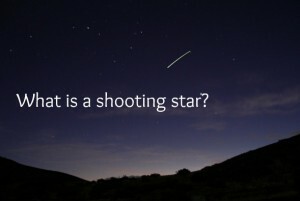 But what exactly is a shooting star? Is it a star falling out of the sky? a dying star? a comet? A shooting star is actually a particle from space colliding with the earth’s atmosphere. We call these particles meteoroids, and they can be as small as a particle of dust or as large as a tennis ball. As the earth travels around the sun, we run into some of these particles. When they hit our atmosphere, they burn up and create a beautiful path in the sky, called a meteor. The larger the particle, the more impressive the display. If the particle does not burn up completely in our atmosphere, pieces might make it to the ground, which we call meteorites. Several times during the year there are opportunites to see a large number of meteors during the night. 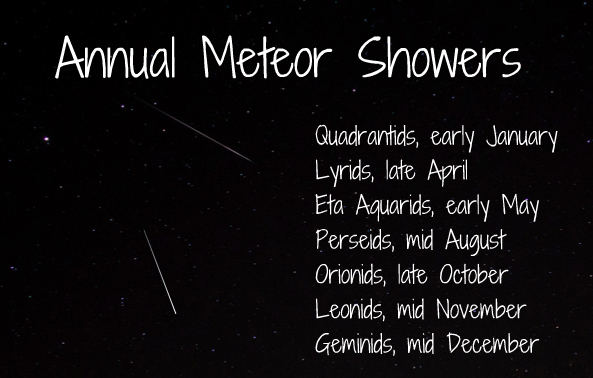 These events are called meteor showers. This happens when the earth passes through the debris left from a comet traveling in a very elliptical orbit around the sun. Because we know where these comets’ orbits are, we know exactly when we will be passing through their debris each year. Stay tuned to Lie Back, Look Up for more information on viewing the Perseids meteor shower, occurring on the nights of August 11th and 12th. 6 Responses to What is a shooting star?